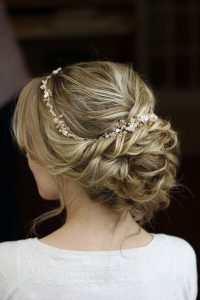 Now when brides come for their Wedding Hair and makeup trials I have a selection of beautiful hair jewellery to help them design hair styles with. 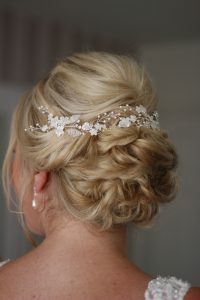 I found Brides often don’t know where to start with their hair jewellery, do they buy something before their trial for example. But what if it doesn’t work with their finished style? Will it work with a veil? Having jewellery at the point of trial to use to help them imagine what would suit their style has really helped my brides. 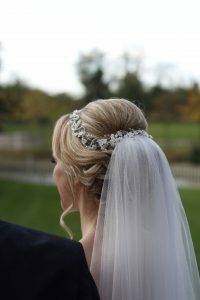 It also helps them find something more unique to their wedding colours, dress design and hair style. 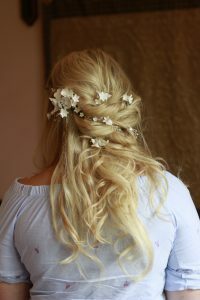 The Hair pieces are incredibly light and do not alter the design I have created for the bride which some bulky heavy hair combs can do. 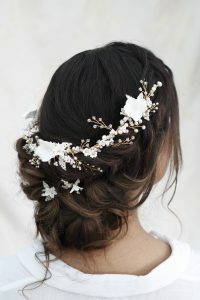 What I love most is that PS with love will change the hairpiece into a piece of keepsake jewellery after the wedding day. LOVE! 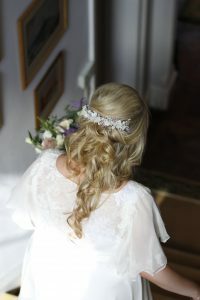 I think you will agree these pieces have complimented these brides hair beautifully.